I made a breakfast table decision way back when my kids were still small enough for a highchair and booster seat: I will do my best to anticipate my family’s morning needs—providing something to eat and drink, and even something to spread on their toast. But once I sit down? I’m not getting up again until I’ve finished my own breakfast. More importantly, I’m not getting up until I’ve enjoyed at least one cup of coffee. This was a stroke of wisdom that must have come from above. It’s a small thing, but it set the tone for a very big idea: I might be a mom, but I am a person, too. I also get hungry, and tired. I, too, like to sit down and enjoy my breakfast. And some day, as I explained to my toddler, you will understand the magic that’s contained in this coffee cup I hold so lovingly. Is it possible to love yourself without being selfish? But even with that precedent set early, I have continued to struggle with this particular aspect of being a mom: how to balance serving my family with advocating for myself. Because I do believe that serving those I love—especially those little ones I brought into the world—is part of my role. 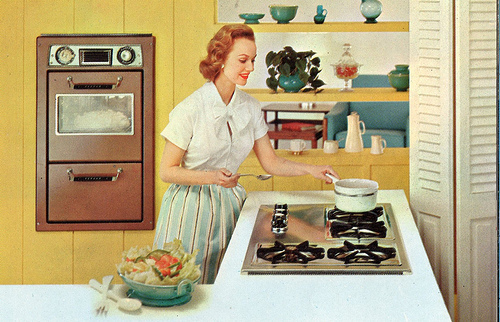 I don’t mean that in a “vacuuming in heels, putting on lipstick, and making sure dinner is ready when my husband comes home” sort of 1950s way. I mean that serving is a form of active loving. Creating a safe place, where essential needs are heard and met, where I can set aside my own worries to listen to someone else’s, is part of what I signed on to when I decided to bring kids into the world. To be honest, I have felt physically sick over this. For two full months. I haven’t found peace in either argument, even though I went ahead and signed up for the conference weeks ago. The best I can do, I’ve decided, is miss the last day of the conference and come home early to see the final performance. It’s a compromise, and maybe that’s the lesson I’ll take home. I am both a mom and a person. I have a responsibility to my kids and to myself—to love and look out for all of us. In order for this balancing act of love to work, we all need to practice honesty, listening, compromise, and forgiveness. And as the mom, it’s my job to lead the way. My mom is a wonderful mom but I grew up with a limited idea of womanhood because our family life was so insular. I don’t think she would regret her focus but it’s not a path I could follow to the same degree. Even now with my brother and I long out of the house, her dreams and interests defer to my dad, who is more of a homebody. It’s important to model for kids what a balanced life looks like. It sounds like you’ve achieved a good balance, Kristin. I’m so disappointed for you that the conference falls on the same time as your daughter’s play but it sounds like a decent compromise. You’re setting a good example for your kids in every possible way. I’m so glad that I’m not alone in feeling this way. Growing up, my mom sacrificed a lot of what she wanted for us. Except for her writing. Every day, she sat down and wrote(long hand on notebook paper) her novel. In some ways, she taught me that we had to learn to pick and choose what is most important to us. Right now, my writing is my “thing” that makes me feel like a real person. Everything can be put off till later for kids’ stuff. You asked for a father’s perspective, so here goes. I’ve observed my wife dealing with the same struggles you mentioned. There are things that are personally and professionally important to her, and I try to encourage her to participate in those things as much as she can because I know she deserves to experience those things, but it’s very clear that her first priority is always the kids. With my job, I’ve had the chance to travel some to various conferences, and I usually don’t think too much about it because I know that my wife is capable of keeping things in order. That’s not to say it’s easy for her, but she can do it. I appreciate that sense of assurance and dependability she provides for all of us. Having said all of that, as a father, I’m aware of the organizations and movements in our country that exist solely to champion fatherhood in order to reverse the trends of fatherlessness. There are too many kids that grow up without dads, either because of divorce or abandoment or whatever, and those things echo in my head every time I have to miss even the most insignificant of events in my children’s lives. As a dad of two kids (2yo and 5mo), coming from a family where my parents never missed a game or performance or anything. I look back on that thinking I wonder if that’s what they wanted to do, if they had other interests? I also wonder what will happen when my kids start being involved in more things?. My wife’s family, no less loving, had a different approach. Her father always says to me, “the kids are the center, the parents are the center”. He means, I think, that for the kids to understand good healthy relationship the most important relationship is that of the parents. So, in turn, my wife and her siblings did not always have a parent present at their games, recitals, shows, etc. I think I come down where you are at this point, I will do my best to be at everything that I can for my kids, they will know that I love them, and I will ask them a bunch of questions if I miss something. I will also tend to my own needs. I think missing your child’s performance because of your favorite conference is not selfish, I think missing it because you planned a wine tasting weekend with the girls might be a little different. It’s a balance, my wife and I have a partnership and we will do our best to make sure that we are both being fulfilled and supported in our call to be parents. Good topic and great question. I make a motion that you and Shawn Smucker shut down your blogs for a month so the rest of us can feel like we have two decent thoughts to rub together. These are tough things. I have no answers. I have understanding. Haing walked in the door from a hair appointment, four mouths immediately began a litany of immediate needs. Do I stop and hear each one, or do I get to put my purse down and take a sip of water first? Sure, I was just on my rear getting hair magic on my head, but can’t you give me two seconds to think? You will make the right choices, and your daughters know you love them like they know the sound of their heartbeats. That I know. As a non-mom, I don’t know how much I can relate, although your post triggered a memory of a post on another favorite blog of mine, A Practical Wedding. (Here’s the link). It’s about not making ourselves into martyrs by sacrificing so much of who we are that we both lose ourselves and resent those who we’re sacrificing for. I don’t think that’s what you do, but I think your declaration that you’re a person too is an important thing to keep yourself from reaching that self-martyrdom point. You must care for yourself if you want to care for others, and it seems that is forever a balancing act. I think your compromise sounds like a good one, even if it means you won’t get to fully be one place or the other. I struggle with this constantly. Constantly. Thanks for these brave thoughts and for giving me the space through your words to make some room for myself. it is such a hard balance, and i know that i need better discipline and boundaries. if i don’t provide well for myself, then i find myself stealing time from other places, which always ends up with me feeling guilty for half-assing mothering and angry at the incessant demands. we can’t serve joyfully or love well if we are empty and worn-out, but it is still so hard to be intentional. Thank you for putting into words what I feel most days. I am a super involved person, by nature, so many times that means I am less involved in my family stuff. As my kids have gotten older, I’ve been able to share with them why I do what I do. Cheerleading advisor- for the money to allow you to play all these sports, Negotiations- to support all the teachers in our schools…you get the picture. My husband is incredibly supportive and that helps. But the guilt is still there; in fact the one who lays on the most guilt is my mom, who raised me as a single mom with 2 jobs. Hmm?! **There’s a scene in A Christmas Story where the narrator says, “My Mom hadn’t had a hot meal in the last 10 years” because she was constantly bouncing up and down from the dinner table to get stuff for others. **My wife doesn’t love coffee–she loves sleep (and is barely human until 9:00AM). She taught each of our three kiddos how to serve themselves cold cereal — when they were 4 years-old! **Kudos to Leigh for her observation, “I grew up with a limited idea of womanhood because our family life . . .” Yet, we are all victims of our era. **And, number 15: Now that two of our three have flown the coup, there’s also a need for the long view: There’s a lot of living left to do after they leave. If you’re going to err, self-sacrifice is a pretty good mistake. Cory, thanks for sharing the dad/husband perspective! I have a sense that this issue is particularly tough for moms, but I didn’t want to rule out that dads feel it too (and that they struggle to help balance things for their wives by supporting/encouraging them). It becomes a complex thing for everyone involved. Your awareness and desire to be there in important ways is huge, though. Greg, it’s great that you and your wife have two different—yet both healthy—examples to look at, talk about, and draw from. The talking things through, as spouses and as parents with our kids, is really the key, I think. A big part of what I was dreading about this conference/play situation was telling my daughter I wasn’t going to be there opening night, but it also provided a great opportunity to talk it through with her—to explain how hard it was for me, and why this conference is so important. In the end, I think it’s really healthy to be forced into these tough conversations. Jen, from everything I know about you, you are the model of a mom who loves and cares for her kids but also demands that they recognize you as a person. I can just picture you in each scenario, can hear the reasonable-loving-sassy words coming out of your mouth. Being a runner is also a great way to demand time and space—they’d have to get pretty darn good at running to invade! So, have you somehow escaped the mama guilt monster? Hi KT, long time quiet here. For peace of mind, I use a “how often does it happen” rule with a tie breaker “which was I aware of first” rule. An biennial conference beats a play, an annual conference loses to a birthday (tie breaker), and a funeral trumps all. (Also, a little bit of sadness for missing a child’s event increases one’s appreciation level at the next event). I’m not (yet) a parent, but I saw this with my mom: she gave up a great deal of her identity to be our mom. And while I know she loved it, she struggled to regain her sense of self after my sister and I left the nest. I know your daughters know you love them deeply. And they will appreciate you modeling self-care when they are grown up, trying to balance all the things you’re trying to balance now. I generally don’t struggle with the mama guilt monster. I don’t know why – perhaps I’m selfish? I feel really strongly that it’s good for my child to know that I have a job and other interests. I prioritize her needs as her age dictates, but I sure don’t subjugate myself to her. I work out regularly, have “dates” with friends, I missed Halloween this year because of a work trip to Japan and that is the one and only celebration I usually attend at her school. Her dad took the day off so that he could attend, and she was happy for the parental presence. I sometimes think it’s easier for me because we have a super independent child. She’s never been clingy and has always been very bonded to other adults in our lives. She can easily substitute one of them for either of us. Not in a permanent way, of course, but in a flexible, as-needed way. A few years ago, when she was five and in a period of particular attachment to me, she and her dad were away for 2 weeks in the summer (he’s a teacher so they usually visit relatives without me or longer than I can be away). She did miss me and solved the problem by adopting another “mom” – our sister-in-law’s 17-year-old sister – while on vacation. She even articulated that this was her strategy. I’m glad! I think my husband struggles more with this kind of guilt than I do (but then again, he was raised a Catholic). Kristin – I think you have found the perfect solution – attend the conference but leave a day early so you can get home for the final performance. That is completely reasonable and surely a compromise that S can understand. Leave the guilt behind and enjoy the conference while you’re there and enjoy the performance while it’s happening (and take her flowers!). The Modern Gal, that wedding planning example is a good one! Compromise can go overboard—just think about mixing too many colors or flavors together; all you end up with is indistinguishable mush. I think keeping in mind what motivates us to compromise (there are healthy and unhealthy motivations) helps a lot. Addie, I love how you put that. We do give one another important space through our words. I’m so glad this did that for you. Jonelle, that’s a great point—sharing your rationale with your kids is so important! Even if they don’t always fully *get* why we’re doing what we do, at least they know we don’t make these decisions carelessly, or without thinking of the big picture and other people. Ray, thank you! And I like it when you go the “random thoughts” route in your comments. :) This point is particularly important: “The spouse (husband or wife) should be the champion of the the other’s personal needs.” It seems both obvious and often-overlooked. I only know how important it is because my husband is great at championing my needs when the kids need a bit more help “getting it” (and I’ve done the single mom thing, when no one was advocating for me but me!). Katie, you bring up a really important point: What happens to a mom’s identity when her kids grow up and leave the nest? Ideally, that transition can be a bit easier for everyone involved if the right balance is struck even when the kids are still little. I needed to read this today. We have one toddler (so far), so we’re just beginning to make these decisions: how do we pursue and hone talents and be parents? How do we keep our marriage healthy and thriving? How do I enjoy a cup of coffee in the morning? I’ve struggled a little bit with leaving my little guy for five days. Will he feel abandoned? Then I feel guilty because am I struggling enough with leaving him? When it comes down to it, I’m looking forward to this conference. I need it. Oh, well. Everyone needs some reason to complain about their parents. Might as well start Keegan’s list early. Dave, it’s good to hear from you! I love the “rules” you apply to making these decisions—especially because they affirm my decision! My daughter is in 2-4 plays every year. :) Thanks for the wisdom! Hope you are well. Nicola, I’m so glad to hear that not every mom struggles with this! You’ve always seemed very matter-of-fact and decisive to me, which I’m sure helps separate the emotions of these situations from the “facts.” What you said about your child’s age and her personality dictating her needs is so true! In my case, Q is the really independent one—if one of her activities had been the one in question this week I wouldn’t have struggled nearly as much with the decision. She loves having me at her games, etc., but she doesn’t take it personally when I can’t be there. Heather, I’m so glad I was able to throw some helpful words out there! Of course, there is no ideal strategy for any of the balancing acts you describe, but just being aware and purposeful is huge. I’m so glad we’ll get to meet this week!